For those of you that don't know, I work with CK Studios and maintain their Alumni group. 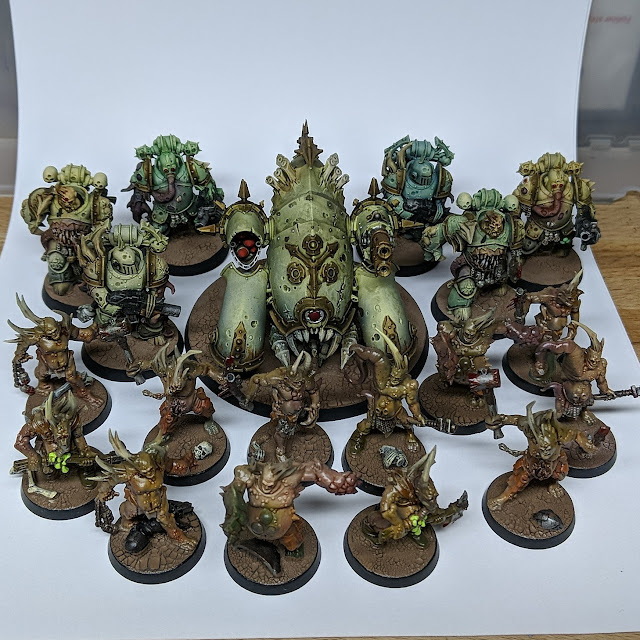 I love doing this and as part of the group - I put together a course for folks wishing to take on a new project that in the hopes that it will help people get fully painted armies done and on the table. My buddy Ulrich was the guinea pig for the project with his excellent blog http://jawcrakas.blog which I've already mentioned here on the blog (you really should check it out!). Death Guard Marines - choosing an army scheme. It's a new year, time for new beginnings and for me, that meant - deciding on a new armour colour scheme! Determining a new painting scheme is an interesting process. I really struggle to visualise how colours will look on a model (I've mentioned this before particularly - here). For the Death Guard army I've been building up as part of the Conquest Magazine subscription. The thing is - I never really understood why Death Guard changed uniform colour during their time lost in the warp. I can imagine the palette shifting, tainting somewhat but having a total uniform change in the warp just seems weird. So I'd decided to go for a more traditional, pre-heresy aesthetic.